Well, July has come and gone. I still don’t know where my summer went. The last few weeks have been really busy with work, biking, the beach, and more visitors. Nic runs his first marathon on Grand Island on Saturday. He has been training all summer and I am excited to watch him and see how he does. Crazy guy, I could never run for that long. 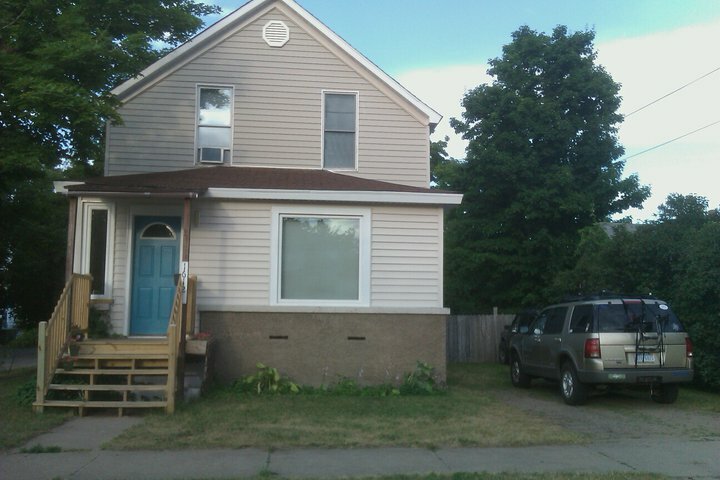 We have done some more work on the house. 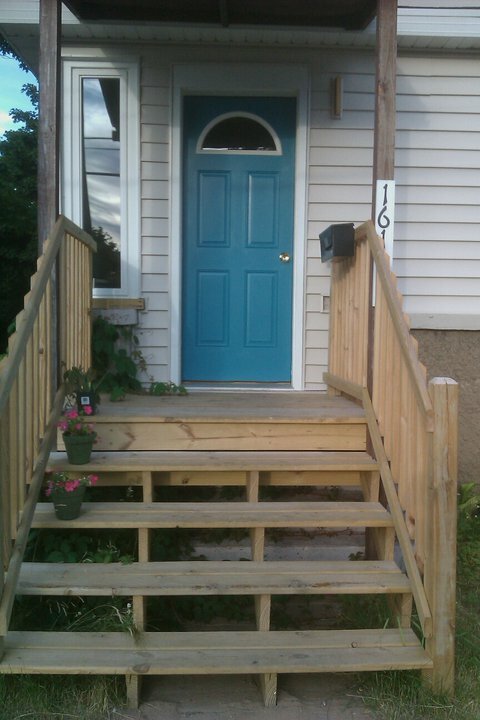 Painted the door bright teal. I am loving teal lately. 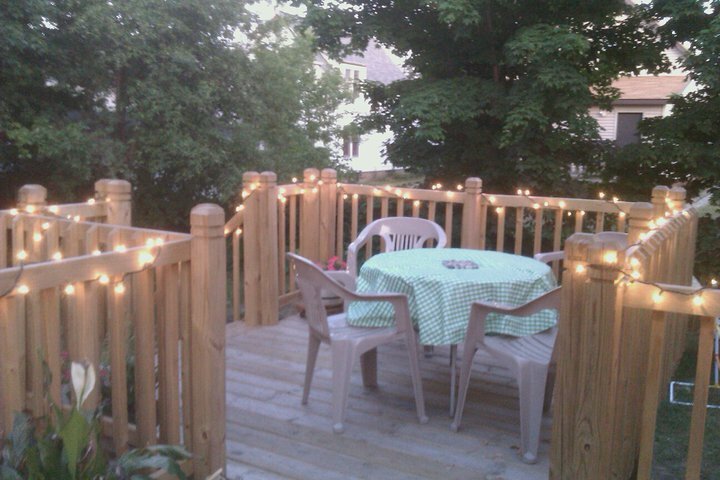 I also put some lights up on the back deck so that we can sit outside and have drinks at night. It looks great. We are finishing up the front porch this weekend. I am putting up toe boards and lattice so that you can’t see the crumbling, old concrete steps behind the new ones. Blueberries are just starting to get ripe. By next week, we should have gallons of them! Raspberries are almost ready also. My new favorite snack is baked kale chips. We always get kale in our CSA box and it is the only way that I like to eat it. Sauteing kale is just too chewy for me. I made a huge bowl of them last night and ate it all by myself. I can’t feel that guilty because it is a healthy snack right? Set oven to 325. Rinse kale and rip it off the stems. Rip it up into bite sized pieces and toss into a bowl with a drizzle of the olive oil and vinegar. Then sprinkle with seasonings (grated parmesan cheese works great too). Toss everything around so the kale gets covered. Spread out on a greased baking sheet and bake for 13-16 minutes until the kale gets crispy. YUM! Lake Superior Day is July 17th, 2011. What are you doing to celebrate the largest and most beautiful of the great lakes? Life has been really busy lately! But I thought that I would do a little update to keep everyone in the loop. 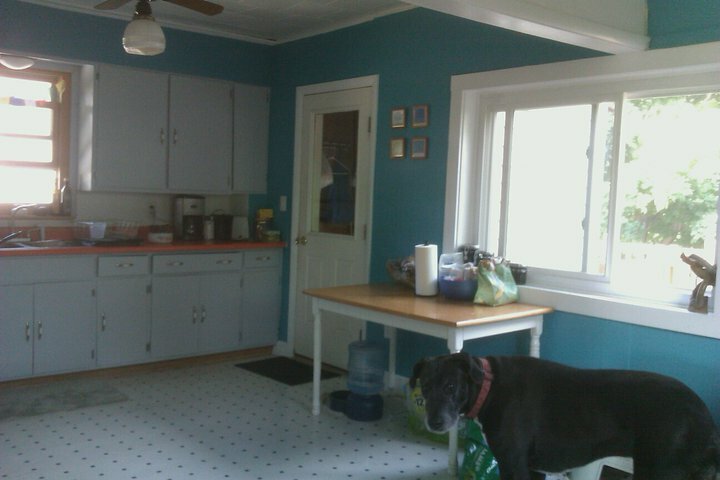 Nic and I finally finished painting the kitchen. We had to do about 7 coats until we found the right color that we liked. It looks great though! Exactly what I imagined it to look like. New wall color. The door is now the same color as the cabinets. I started working at the Landmark Inn in Marquette about 2 months ago. I am bartending and serving at banquets. I only work 1-2 days a week but it is putting some extra change in my pocket. It is also nice to work with people, compared to my desk job. I like being on my feet and interacting with everyone. The past couple weeks have been filled with visitors and fun! My friend Tiffany came up from Chicago to enjoy the U.P. weather. And man was it HOT! 80’s and 90’s with plenty of sun. Perfect for the beach. We took our first dip in the big lake this year. brrrrrrrr. We also rode bikes around town and had a couple beers on the lake shore with friends, overlooking the city lights. On the 4th of July, I went kayaking down the AuTrain river with a bunch of friends. It was a blast! The river water was very warm and the sun was abundant. Couldn’t have asked for a better day. 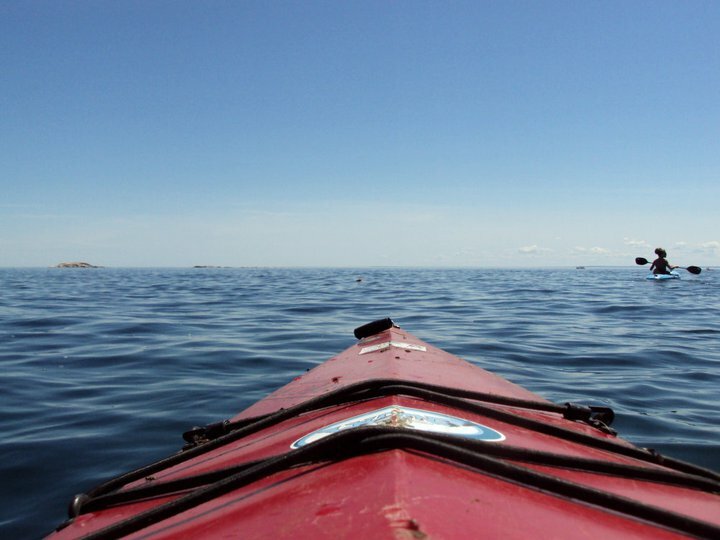 I was so tired from the sun and kayaking, that I slept right through Marquette’s fireworks. Oh well. I needed the sleep considering I also worked the entire weekend at the restaurant. My parents and their friend came up for my B-day on the 5th and we had a great day relaxing. We did some shopping, ate some sushi and watched a movie after taking the dogs to the beach.